month a year ago, new listings across the 23 counties in the report were down slightly (79 fewer units). mutually accepted offers since July, and nearly matching the year-ago total of 10,311.
growth, all point us in the right direction for red-hot acceleration again this year,” Scott stated. percent when comparing February to March. – the home,” stated Rebhuhn, the owner of Village Homes and Properties in Woodinville. active listings to 4,263 at the end of March. Nine counties reported less inventory than 12 months ago. more approachable sellers, according to officials with Northwest Multiple Listing Service. over-year decline since May 2018 when the drop was about 2.7 percent. HomeServices Signature Properties in Seattle. months ago, including King (up nearly 7.5 percent) and Snohomish (up 3.8 percent). rates, strong job growth, and adjusted pricing. as a transition year for residential real estate. and closed sales show drops overall, while prices rose from the same month a year ago. the volume of closed sales dropped nearly 16.6 percent (6,374 versus 7,642). are paying attention will find very good values and receptive sellers. advised Beeson, the principal managing broker at RE/MAX Northwest in Gig Harbor. Brokers said many of last month’s buyers took advantage of the shifting market. broker at Coldwell Banker Bain. said Robert Wasser, a director with Northwest MLS, when comparing those metrics with September. percent, but year-over-year inventory rose 33.2 percent, from 13,680 to 18,223 offerings. Brokers generally welcomed the bump-up in inventory. than a month (0.98),” he stated. improving on the year-ago figure of about 1.5 months of supply. Puget Sound region, a dozen counties reported drops in the number of active listings compared to last year. County, supply exceeded two months for the first time since January 2015.
listings, a 22.9 percent improvement from twelve months ago when selection totaled 15,888 listings. softening. A market shift may be under way, but they believe activity will stay strong. also noted interest rates, currently in the upper 4 percent, are projected to rise in the coming months. of the past several years,” said John Deely, principal managing broker at Coldwell Banker Bain. Folks didn’t want to hear that story back in 2011, when I first began pounding the table. Investors were scared. Nobody wanted to buy. That’s why housing was such a great deal, though. It was dirt-cheap and hitting all-time levels of affordability. U.S. home prices have steadily climbed, and housing affordability has fallen as a result. Today, housing affordability is at a decade low. But as I’ll show, that doesn’t mean the boom is dead. The idea of housing affordability is simple. When someone buys a home, he doesn’t worry so much about the purchase price… He worries about the monthly payment. If he can afford the payment, he can afford the house. The monthly payment includes a few numbers… namely the home’s price and the interest rate. Compare that with the person’s income, and you know how affordable (or not) a home would be. Importantly, these numbers are similar for a lot of folks. So the National Association of Realtors uses median home prices, median income, and mortgage rates to build an overall measure of housing affordability in America. This indicator tells us if housing is cheap, expensive, or somewhere in between. A high affordability number indicates housing is cheap… signaling a great time to buy. A low number indicates an expensive market, where folks will have to stretch to buy. You can see that housing is getting less affordable. It recently fell to affordability levels not seen since 2008. But that doesn’t tell the full story. It’s true that the easy money in real estate might be behind us. 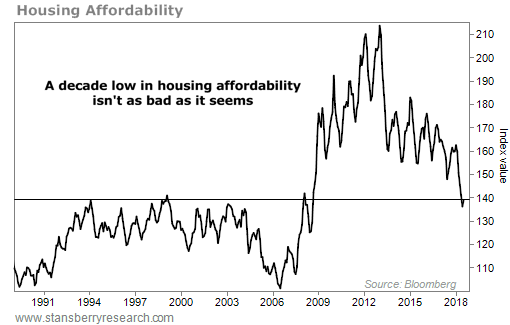 But affordability hasn’t completely dried up. We are clearly in the late innings of this boom. The great deals are getting harder to find, but certain markets still have plenty of value remaining. I’ve personally put a large chunk of my net worth into Florida real estate. I’ve sold some of those properties for big profits… but I’ve been able to find new deals too. 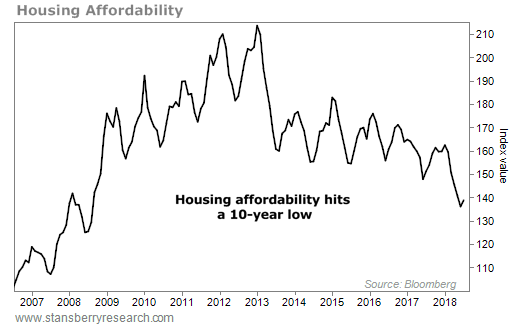 So while affordability is down, I remain bullish on U.S. housing. We’re still near the long-term average for affordability in U.S. housing. And folks can still make money in U.S. real estate. If you’re looking to put money to work, buying a house is still a solid deal today. from Northwest Multiple Listing Service. brokers say they are not bracing for a bubble, or even anticipating a quick shift to a buyers’ market. when buyers could choose from 19,724 listings. Compared to July, inventory was up nearly 11 percent. active listings a year ago to 5,803 at the end of August. – well below the “balanced market” range of four-to-six months. offers last month, a drop of 14.8 percent from a year ago when they tallied 11,867 pending sales. citing “one of the best job growth markets in the nation” and favorable interest rates as contributing factors. communities as builders try to move inventory of completed homes,” he noted. With demand strong and supply weak, the housing market is overwhelmingly partial to sellers. The average homeowner is profiting $40,000 at resale (with decade-high returns in 2017), and higher in the hottest markets, where they’re attracting multiple offers in record time. Now, there’s an early indicator that the market may shift. At the start of summer, 14.2 percent of listings nationwide had their prices reduced, according to a new report by Zillow. At the beginning of the year, 13 percent had cuts, and at the close of 2016, 11.7 percent were lowered. The increase between January and June is the largest on record in the report, and doubled the jump in the same six months in 2017. The bigger bounds are generally on higher-priced properties, and on the West Coast, the report shows. Of costlier listings, 16.2 percent have been slashed since the start of the year—up 0.9 percent. By comparison, 11.2 of lower-priced properties have been reduced—down 0.1 percent. The disparity illustrates the immense interest in more practically priced properties, which are in scarcer supply. The amount of discounted homes increased the most in San Diego, up 7.7 percent in the last six months, to 20 percent. The amount climbed in Denver, Las Vegas, Orlando, Portland, Ore., Sacramento and Seattle, as well. On the flip side, the share shrank in Philadelphia, from 17.2 percent to 16.2 percent, as well as in Indianapolis, Pittsburgh and San Antonio. Is the change a change in dynamic? According to Aaron Terrazas, senior economist at Zillow, the concessions could be a premature sign of a swing, but not yet. “The housing market has tilted sharply in favor of sellers over the past two years, but there are very early preliminary signs that the winds may be starting to shift ever so slightly,” says Terrazas. “A rising share of on-market listings are seeing price cuts, though these price cuts are concentrated at the most expensive price points and primarily in markets that have seen outsized price gains in recent years. For more information, please visit www.zillow.com. Millennials should be making a sizable stamp in homeownership, but they have been largely absent from the housing space. Why is it that the largest generation in U.S. history isn’t participating in real estate as heavily as its predecessors? There are many difficulties standing in their way, according to new research. A recent report by the Urban Institute, “Millennial Homeownership: Why Is It So Low, and How Can We Increase It?” delves deeper into the generational home-buying gap to assess the factors that are holding millennials back from their homeownership goals. When looking at the 25-34 age group, millennials are behind Gen Xers and baby boomers in homeownership rates by 8-9 percentage points, according to the report. When comparing overall homeownership rates in 2015, millennials were behind baby boomers by 42.8 percent and Gen Xers by 28.2 percent. While factors such as parental wealth and creditworthiness play a role, there are more overarching influences on the millennial homeownership rate. The biggest obstacles? Settling down is being pushed further out. Millennials are delaying major life events such as marriage and childbearing. These milestones are typically associated with higher homeownership rates; in fact, the possibility of owning a home increases by 17.9 and 6.2 percentage points, respectively, for those who are married or have children. According to the 2015 American Community Survey by the U.S. Census Bureau, 40 percent of millennials are married. This is 7.5 percent lower than the 2000 rate for similar age groups, and 13.8 percent lower than the 1990 rate. The average marriage age is being pushed out further out: Between 1990 and 2015, the proportion of 18- to 34-year-olds who never married increased by nearly 20 points to 53.9 percent. Many millennials are also waiting longer to have children. Between 1990 and 2015, the proportion of married households with children (with a household head age group of 18-34) decreased from 36.9 percent to 25.7 percent. High student loan debt is tightening millennials’ wallets. When compared to preceding generations, millennials are more likely to pursue higher education. According to 2015 rates, 65.8 percent of millennial household heads received some level of college education, a 10.1 percentage point increase from 1990 and a 13.3 point increase from 2000. However, rising education costs have far exceeded income increases, creating a debt challenge. An estimated 36 percent of millennials have student loan debt, compared to 18 percent of Gen Xers and 4.1 percent of baby boomers. Data from the Federal Reserve Bank of New York show that a 25-year-old’s average education debt has increased from $4,516 in 2003 to $10,033 in 2015. These high levels of debt are proving to be homeownership barriers for millennials who are struggling to save for a down payment while paying off their loans. They also increase debt-to-income ratios, potentially making it more difficult for them to obtain a mortgage. Exorbitant home values are pricing them out of homeownership. Members of the millennial generation, especially those with higher levels of education, typically flock to more populous locations, such as New York City and San Francisco, in search of high-skilled cities with employment opportunities and urban amenities. These areas tend to be more expensive, with low housing elasticity due to a shortage of new construction for starter homes, the report states. Additionally, many millennials are rent-burdened, paying more than 30 percent of their income toward rent, leaving them less room in their budget to save for a down payment. According to research by the Pew Charitable Trust, the transition to homeownership is slower for rent-burdened individuals. The demand and pricing for rental housing dramatically increased after the financial crisis. The racial divide remains a far-reaching challenge. Millennials are the most racially and ethnically diverse generation. The increasing share of minority members, and the added home-buying challenges they experience, is lowering millennial homeownership rates on average, cites the report. According to 2015 statistics, white households represent the highest share of homeowners, making up 39.6 percent of all households. Meanwhile, the Hispanic homeownership rate decreased to 24.6 in 2015, and the black homeownership rate has been in continuous decline since 2000, sitting at 13.4 percent in 2015. The Asian household rate has fluctuated, dropping between 1990 and 2000 from 30.6 to 26.6 percent, before increasing to 27.2 percent in 2015. How can the industry overcome these challenges? According to the report, many potential homebuyers are not aware of down payment assistance, especially first-time buyers. The first step to correcting this problem? Increasing awareness of government-sponsored programs through financial education as part of a high school or college curriculum. Additionally, the Urban Institutes proposes a streamlined and tech-centered mortgage application that shortens the process and more thoroughly assesses risk. The underwriting process should also be revised to include factors not typically within a credit score assessment, such as rental payment history, in order to assist consumers with low credit or a lack of credit history. Other proposed solutions take the form of revised student loan debt reporting, changes to land-use and zoning regulations, and reduced racial and ethnic disparities. softening market,” he added in commenting on the latest MLS statistics. continued to rise, increasing more than 10 percent from twelve months ago. outgaining sales, total inventory as measured by active listings and months of supply improved. the highest level since September 2016 when there was 1.37 months of supply. months, we experienced dispersed buyer energy due to the greater availability and selection,” stated J.
year for homebuyers,” he remarked. the market as “more than just lackluster” with summer showing no sign of improvement.